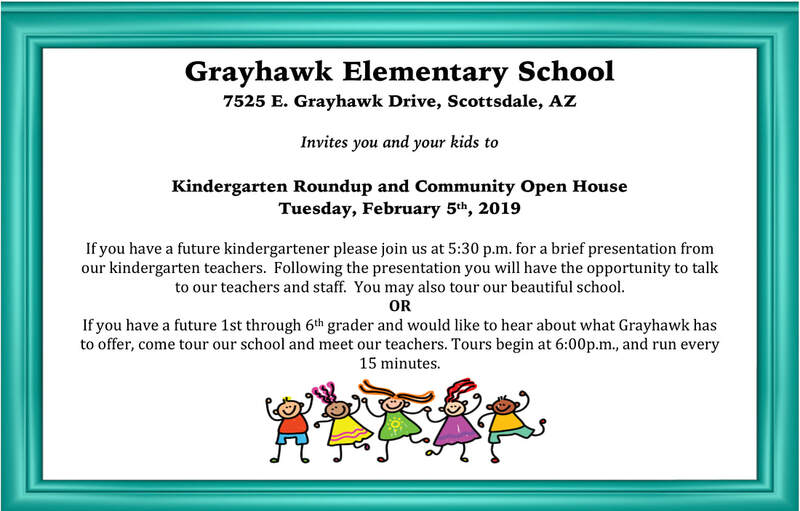 Please join us for a family fun night at Grayhawk Elementary School. We are excited to show you all the new and improved changes to our school. We will be hosting a Kindergarten Round Up on Tuesday, February 5th from 5:30-6:00. Come meet the teachers, learn about our programs, visit the classrooms and win some prizes! Please bring your future kindergatner with you to this fun event. The community is invited to an open house to learn about our school starting at 6:00. Feel free to come in anytime between 6:00-7:30. We will have guided tours running every 15 minutes. If you would like a tour, please meet in the lobby. Come meet our teachers (K-6) and check out our STEM lab and newly remodeled library. PTO and our Student Ambassadors will be there to answer questions. We hope to see you and your family there! Please share this invitation with others.